Surprise, surprise—my blog is alive! It has been months since I last wrote an entry here, and I blame it all on YouTube. It has completely taken over my life (my digital life, that is). I’ve been having a lot of fun doing shopping hauls, collaborating with fellow creators, documenting my trips and showing my real goofy self–something I can’t seem to show on my Instagram feed. bed and I’m doing something productive really excites me. Ha! Clearly it had to rain for a whole week for me to realize that I’m abandoning my blog. Whoops! With all the July gloom we’ve been experiencing recently, I thought it would be fitting to whip up a simple style guide on what to wear during the rainy season. It can definitely be tough to dress for this season because there are quite a few things to consider from what material to wear and what not to wear (should I wear my white sneakers or suede boots?). How to stay dry without sacrificing style, etc. Basically, dressing for the rainy season can be more challenging that it is during summer—at least for me. Don’t fret, I have gathered ten of my favorite no-fail rainy day ensembles which you guys can easily recreate. Stay dry folks! I have been living in this red sweater for the past few months—even before the rain started to pour all over Manila. Long haul flights, hotel staycations, late-night meetings, name it—this red sweater is a no-brainer for me. I am laughing at myself as I type this because I’m wearing the sweater right now. Haha! I just love the color, the oversized fit, the way it falls over my body—it’s the perfect choice for the rainy season! If you’ve seen my shopping haul video, I was quite confused as to why I purchased this sweater during summer. I’m glad I purchased it right away when I saw it on the racks of Bershka! You’ve probably seen this jacket and tote a couple of times on my blog before, but these are some of my go-to pieces whenever I want to look stylish without exerting a lot of effort. By “a lot of effort” I mean styling it with different pieces and elements. However, this ensemble does not require much styling because my trick is to always stick to one color. As you have probably noticed by now, I am very much into monochromatic dressing—I think it’s such a fun and easy way to look put-together. As for this look, I went with a shirt with light green stripes, a lounge polo in the same shade as my rain jacket and felt tote bag. If I wore green trousers I would’ve looked like The Grinch, so I had to break the colors by opting for a pair of checkered trousers. This outfit is perfect for a day when it’s really raining. I’ve been on the lookout for the perfect parka jacket but this color wasn’t really what I was looking for (I’m eyeing on an olive green one). When I started looking for other pieces in my closet that would go well with this dodge blue parka, that was the only time I fell in love with the color! I know what you’re thinking, “white sneakers on a rainy day? is he crazy?”—lol. I would’ve loved to finish off this look with a pair of brown shoes but I only own suede! You know the rain and suede shoes don’t mix well together. Do you know any brands that carries stylish brown/taupe sneakers? Help a guy out! There’s something about wearing a hoodie that inspires me to be productive. Shallow, I know, but it’s true! Getting warm and snuggly in my hoodie with a cup of hot caramel macchiato in one hand, as I answer emails, write blog posts and be as productive as I can. Moving on to the look, I opted for this dodge blue hoodie from H&M because the color reminds me of summer! I personally don’t like wearing dark colors during gloomy days because it’ll put me in a sour mood. On another note, have you guys noticed that most of the photos in this blog entry were taken indoors? Haha! The struggle of being a fashion blogger during the rainy season. Ahhhh! Here is my best attempt at going for a nautical look during the rainy season. Haha! I always try to get inspiration from summer even during the rainy season. As much as I say I’m a true blue city boy, summer really puts me in the best mood. I guess everyone feels the same? Anyway, I’m really happy with how this look turned out because the color palette is almost grayscale (I think?). When I go for grey pieces, it somehow looks really dark and gloomy, but this look turned out pretty light and airy. Maybe it’s because of the navy blue nautical stripes, or the fact that I took a photo behind a vibrant orange container lol. Either way, you can’t go wrong with this styling for the rainy season! Try it out and see how it works for you! Okay this isn’t really my dad’s jacket, but you get the point. I’m sure your dad owns a jacket similar to this (my dad does, lol). Although these types of jackets don’t really create the best silhouettes, when styled the right way, you will look classic and cool in no time. I got this from a bazaar a couple of weeks ago and it was love at first sight (you guys know how crazy I am about navy blue). The boxy fit of the jacket definitely added some personality to the look! I decided to pair it with a plain white shirt and light colored denim for a total old school vibe. What do you guys think? Since this look is somewhat similar to look #4, I’m going to talk about jeans instead. I live in jeans during rainy days. Quite frankly, they aren’t the perfect choice for a rainy day, but for some reason, I love wearing my favorite pair of jeans during this time. When it rains I want to feel snuggly and comfortable, so I always go for jeans. As of the moment, I always go for 1) light wash denim 2) cropped and 3) tapered. Light wash denim are just visually appealing, cropped because I want to highlight my shoes without having to cuff my pants, and tapered because this type of fit can instantly make you look taller! I wasn’t sure if I was going to include this look in this list but I want you guys to have different options. Now this look isn’t ideal for a rainy day because it’s pretty high maintenance—but if you think you’ll spend most of your days indoors anyway, then I don’t see any problem here. This beautiful knitted cardigan got my attention right away—even if I don’t wear cardigans anymore. I used to wear cardigans a lot when I was in high school (anything to make me look bulkier lol). I guess I outgrew them that’s why you would almost never see me wear one. If you’re planning to buy a cardigan, go for a something light, that way it would be easy for you to match it with other existing light pieces you have in your wardrobe. Knitted ones are the best because it creates depth to your look! There you have it! Those are just some of my style ideas for rainy day outfit possibilities. I’m sure you have your own no-fail go-to rainy day outfits as well. What do you usually wear when the weather is bad? Do you usually dress in darker colors or do you make an effort to brighten up your ensemble? Do you wear jeans or trousers? Let me know in the comments sections below. I hope you guys liked this quick little style guide! Till the next one! Thank you so much, Avery! I miss seeing your name on my blog! Haha I’ll try my best to keep this updated! Haha sweater is life! Nice choice btw! Thank you for reading, Miguel! Always so supportive! Mapa-blog or vlog! Thank you for taking the time to read, Karen! That’s awesome to know, thank you! It means a lot! Nice! Love a good sweater and hoodie too! That’s nice to know, Andrei! Thanks for reading and welcome to my blog! Such a powerful words to end my tiring day. I always believe that everyone must follow and do things that motivates them, its makes you do your work easier and creative is some ways. That’s so true! Thank you for reading, Joenas! PS: Thank you for noticing me on your IG Stories!!!! God bless. Oh cool you’re subscribed to my blog, that’s awesome! Thank you so much! Love your rainy day picks! See you soon! Yassss! Thank you for reading, Karl! Oh they work on suede shoes??! Sweater actually a must item for men. Buy it one with great quality and you will find yourself wearing it again and again. Parka and hoodie is a must when the rainy season come. But how about leather and rubber shoes as a waterproof shoes? I used to wear them before but I almost never wear high cut shoes anymore! Dad! Gawa kana book mo pleaseee! 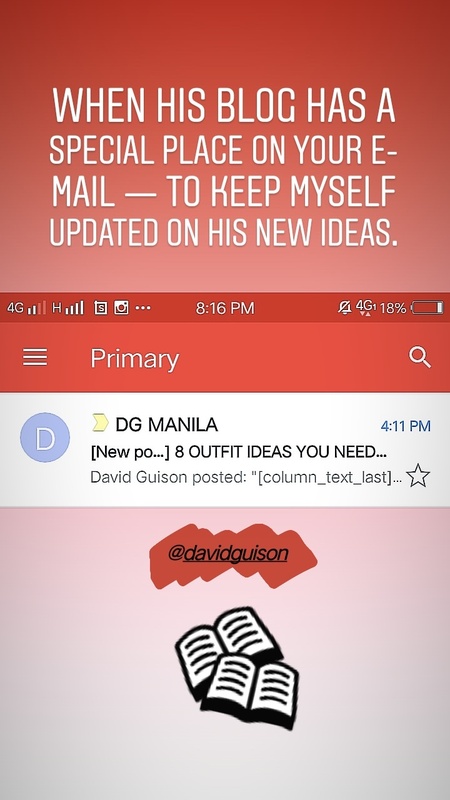 Great post as always kuya David! Si Vina ba kumukuha ng photos mo? Thanks, Andrew! Most of the time, yes! I used to watch your vlogs because of my sister… and when your link led me to this page, whooah such a page-turner. Continue to spread your noble soul man.